The first set of costumes really need to come with a warning. A SUPER CUTE warning, that is. Yes, these baby outfits that you can save on when you use our Angels Fancy Dress voucher codes are more adorable than scary, but we’re certainly not complaining. With current Angels Fancy Dress voucher codes, you can enjoy 10% off your order when you sigh up to their newsletter, so why not get you bub dressed up as an Itsy Bitsy Spider (was £19.99, now £17.99 with code applied), a Dinky Dragon (was £39.99, now £25.99 with codes applied) or a tiny little owl with their What a Hoot costume (was £39.99, now £25.99 with code applied)? But worry not, the cute outfits don’t end when they hit the terrible twos and for all of the best Halloween toddler fancy dress, head on over to our Party Delights voucher codes page. 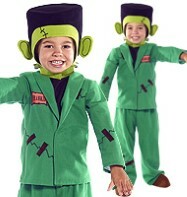 Here you can find up to 50% off selected items, or you can choose to shop in their Halloween store where you can get toddler Halloween costumes from as little as £8.99. 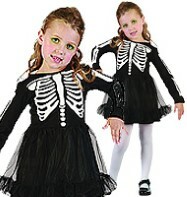 Using our Party Delights voucher codes, we found a, quite frankly terrifying, Skeleton Girl outfit (£8.99), a perhaps more adorable than scary Pumpkin Patch Cutie costume (£11.99) and a Monster outfit (£17.99) – all ideal for your kid’s very first foray into Trick or Treating, and guaranteed to get them a bumper sweet haul! The fun doesn’t stop once they hit school age though, so get in the cool costumes while you can, before they reach the age where they consider Halloween slightly beneath them. Our Party Pieces voucher codes offer some fantastic savings on a wide range of kids’ Halloween fancy dress right now, with up to 70% off selected items and accessories. Our pick of the very scary (and sometimes not-so-scary) bunch includes the Childs Halloween Cat Costume (was £16.99, now £13.99), the Pink Witch Halloween Fancy Dress Outfit (was £24.99, now £17) and the Childs Captain Hook Pirate Costume (was £15.99, now £10.99). For even more to choose from, just use our Party Pieces voucher codes to have a browse and take your pick of the peculiar. 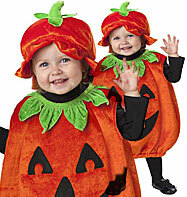 With Halloween becoming more and more popular as every year passes, our selection of costume savings continues to grow. And, with this year’s top selection, if you don’t find the perfect Halloween costume with our Angels Fancy Dress, Party Delights or Party Pieces voucher codes, then we’ll eat our witch’s hat!